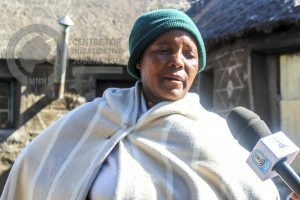 THABA-TSEKA – ’Mabokang Marake battles to contain the pain of losing both her daughter and grandson in one of the most tragic deaths witnessed at Linakeng River in March this year. As different speakers make their way to the podium last week to relive horror of the taxi accident that claimed eight lives, Marake rests her head in her hands covering her face with a checked shawl while weeping silently. Both bodies of the 23-year old Bokang and her one-year old son have not yet been found since the fateful tragedy that shocked the nation on social media on March 22 (watch the video). The minibus was reported to have carried 16 passengers. A total of eight people, including the driver, survived the accident. Three passengers were recovered dead. Five bodies, Bokang and her son included, are still missing. 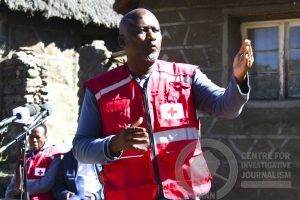 The victims and tens of ordinary villagers attended the communal psychosocial support activities organised by the humanitarian body Lesotho Red Cross Society (LRCS) at Linakeng on Thursday last week. “I know we might not find the body of my grandson (because he was too young) but I need to bury Bokang. I will find peace if they can find her body. It still hurts and I feel like there is hole dug in my heart,” she says, sobbing. The Thaba-Tseka District Administrator Masheane Rapholo, who has only two months in office, told MNNCIJ Linakeng was not the only village that experienced the effects of Climate change around the same time. He, however, pointed out the Linakeng incident was much more catastrophic, “because it claimed many lives and other bodies are still missing to date”. “This is an amazing gesture the Red Cross has embarked on. I believe that there is a need to complement the psych therapy with climate change adaptation advocacy so that Basotho stay alert of the dangers of the fast-changing weather patterns,” he said. The DA was as well sympathetic to the taxi driver he observed was equally a victim in need counselling. The LRCS counsellors called different victims to the podium to share their experiences and stressed that forgiveness was the key to healing. The organisation has held similar activities in the aftermath of hailstorms that also claimed at least six lives in Mount Moorosi, Quthing, in March.